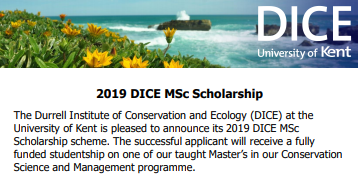 The Durrell Institute of Conservation and Ecology (DICE) is advertising their 2019 DICE Msc Scholarship. This is an opportunity to receive a fully funded studentship on one of the taught Master’s in their Conservation Science and Management programme. Meet the UK Visas and Immigration specifications and University of Kent English language requirements. Applications must be submitted by Sunday 3rd March 2019.